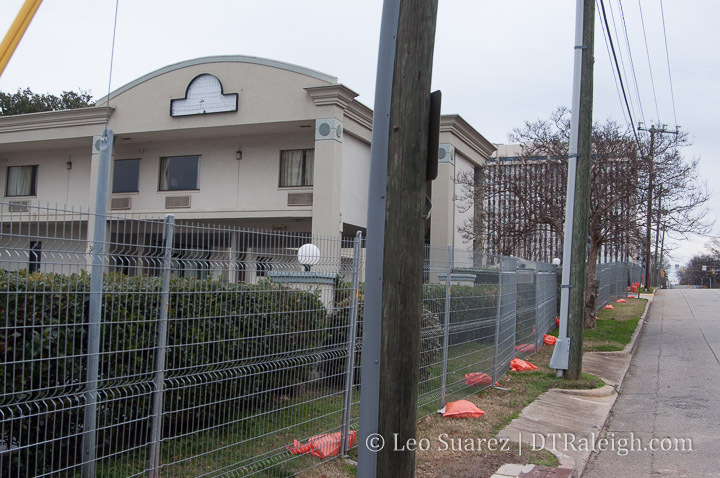 Last December, 2018, the Days Inn on West Lane Street closed. 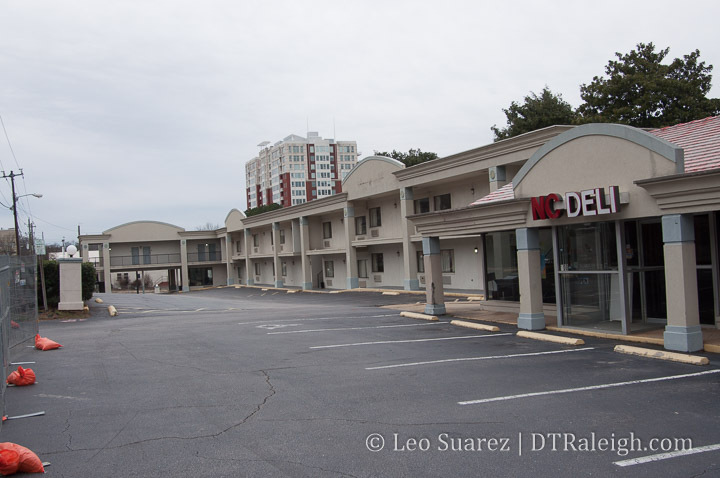 Later, construction fencing went up around the old motor lodge and next-door deli space. A lot of folks took notice and it turns out that local developers have bought the two properties with plans to renovate it all. Loden Properties plans to create a boutique hotel called The Longleaf Hotel as well as overhauling the former NC Deli into Ish Delicatessen. The buildings won’t be demolished but the renovation will be pretty deep so I imagine this year we’ll see the lot looking pretty bare. Reports say the job will take around 9 months so hopefully visitors can start booking towards the end of this year. Google 3D image of West Lane Street. Click for larger. Looking around the area of West Lane Street, the hotel is a few blocks away from some of downtown’s latest developments but nothing exciting is directly nearby. 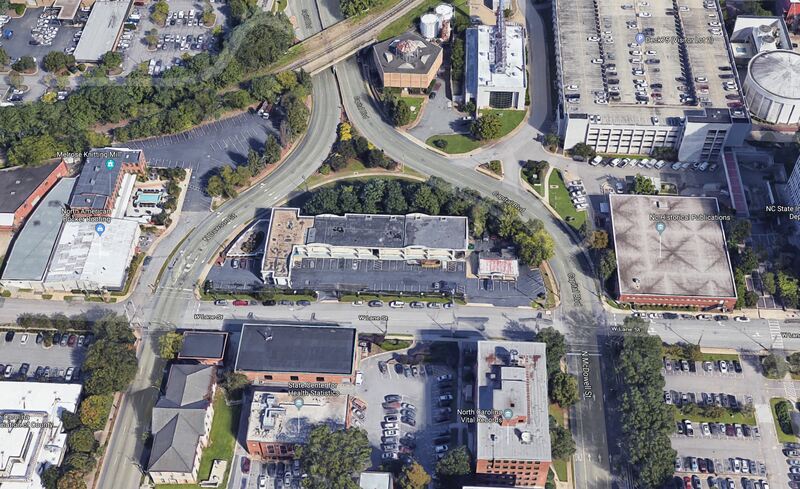 A great location either way and easy walk to Fayetteville Street and Glenwood South, the new hotel would offer a more authentic Raleigh experience compared to a corporate hotel such as the ones near the convention center. It would almost be good to review some of the street paint on this block of West Lane Street. The street is incredibly wide for the amount of car traffic and a sidewalk is missing right in front of the hotel. No sidewalks along West Lane Street. No reason on-street parking wouldn’t work here also. The grassy, shrubby “arch” to the north of the hotel is owned by the state so I expect nothing to change there. The cool thing to see with a boutique hotel like this is that it is going after a more local, unique experience, trying to attract travelers who want the “Raleigh experience”. That should present well with Ish Delicatessen next door as it’s being run by Matt Fern, a veteran of the Raleigh food scene. I’m excited to see how this goes and see some new activity to this area on the weekends.